One of the biggest changes introduced in Fortnite Season 7 is the addition of a completely new type of vehicle - the Fortnite X-4 Stormwing plane. These allow you to fly around the island with up to three buddies balanced on the wings, and the mounted gun on the front can deal a considerable amount of damage to opponents and structures. By using the plane's boost you can quickly manoeuvre into a superior position during dogfights, and if things go too badly wrong then you can always bail out and glide back down to safety. We've marked the areas below on the Fortnite map where planes should spawn, but be aware that they might not appear in all of these places in every match. Also, other players will be grabbing planes as well, so if someone else has already flown off then you'll have missed your chance. 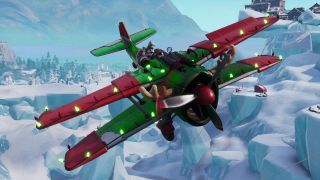 The main places you'll find Fortnite planes are at Expedition Outposts and the Frosty Flights airfield, naturally, though there are a few other places that have planes tucked away. We've got details of where to find them all below. Between the two mountains east of Snobby Shores, you'll find an Expedition Outpost with planes parked up nearby. On top of the hills to the northeast of Pleasant Park, there's an Expedition Outpost with planes sat alongside it. Up the hill southeast of Lazy Links is another Expedition Outpost, with a set of planes waiting close to Hole 6 of the golf course. Perched on top of the large hill to the west of Dusty Divot, sits an Expedition Outpost and a group of planes. Something has clearly gone amiss southwest of Retail Row, as you'll find a plane wedged in the side of a house. It's still useable though, so either shoot your way out or boost through the wall once you've got it running. To the west of Lonely Lodge where several ziplines converge, you'll see an Expedition Outpost and planes just waiting to be flown. To the west of Paradise Palms at the edge of the desert biome, you'll find an Expedition Outpost along with some planes. Moving on to the ice biome, you'll find another Expedition Outpost with a set of planes up the hill to the northeast of Happy Hamlet. On the edge of the map directly south of Frosty Flights, there's a small island with a solo plane parked up on it. Just to the southeast of Frosty Flights, there's another solo plane on a hill next to a tent and fire pit. We've saved the most obvious location for last - the airfield at Frosty Flights has both planes on the runway and parked in the hangars, though it's also a popular location so be ready for combat! Looking for more Fortnite help? Our Fortnite Battle Pass Challenges guide is updated every week to show you the best ways to level up.